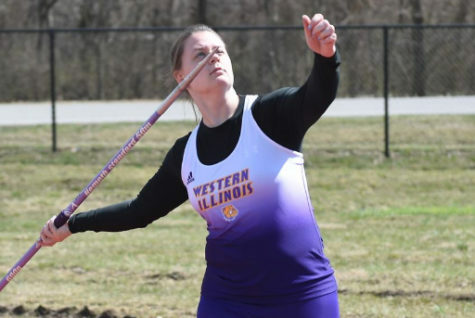 Western Illinois is close to completing another great school year. This year Western accomplished many extraordinary things, but athletics did an amazing job representing our University all year long. The athletic teams in Macomb may not have brought in any championships this year, but they did achieve some difficult tasks. Let’s take a look back at all the memorable moments for the Leathernecks this year. Football season is always a favorite for Leatherneck fans. This past year, the team accomplished great things under the last season of coach Charlie Fisher. The team went 8-4, and 5-3 in the tough Missouri Valley Conference. Seniors Jaelon Acklin and Brett Taylor shattered records. The two led the Purple and Gold to the FCS Playoffs, and ended their Western Illinois careers on very high notes. At the seasons end, many seniors were preparing for the NFL Draft, and awaiting their once in a lifetime chance to play in the National Football League. Four Leathernecks will be on NFL training camp rosters this fall. Acklin, Taylor, Jacob Judd and David Griffith will all have the chance to chase their NFL dreams. When fall comes to an end, basketball season starts right after. Both the men and women’s basketball teams put together impressive seasons. The women’s team finished their season third in the very challenging Summit League. The women beat nationally ranked Stanford on the road, and finished with a 22-10 record. Michelle Farrow broke the school record for most three-point field goals made in a single game with eight threes. The team also broke the NCAA record for most three-point field goals made in a game. The team made their trip to Sioux Falls in the spring looking to repeat as Summit League champs, but came up short losing to South Dakota State University in semi-finals. The team did not come home empty handed; Emily Clemens, Morgan Blumer and Taylor Higginbotham were on All-Summit Teams. Clemens was also named to be apart of the very superior All-Decade team for the Summit League. The men’s team, seeing the success the women’s team was having, had to follow up their impressive resume. The men had a productive season under the four-year coach Billy Wright. The team went 12-16, but the record does not reflect on how the team played this season. The Leathernecks left everything on the court this year, and they found themselves in many closely contested matchups. They had some thrilling moments throughout the season. Senior Dalan Ancrum’s go-ahead three pointers against Eastern Illinois and freshman Kobe Webster’s buzzer-beating floater against Fort Wayne are some that come to mind. We also got to witness the growth of freshman Isaac Johnson, and see Brandon Gilbeck receive Defensive Player of the Year honors. The Purple and Gold went into Sioux Falls for the Summit League tournament as the eight-seed going up against the top-ranked SDSU and NBA prospect Mike Daum. Everyone expected the team to get blown out, but the men had other ideas. They went on to lose 66-60, but were points away from being the first ever eight-seed to upset a one-seed in Summit League history. Before you know it, it’s spring and that means it’s time for baseball and softball. The seasons are coming to a close for both teams. The baseball team is currently 10-25 overall and 7-10 in Summit League play. Throughout the season, we have seen the emergence of a two-headed monster in the pitching rotation with Ian Koch and Ryan Dunne on the rubber. The team will look to close out their season on a high note with postseason play right around the corner. The softball team has exceeded expectations all year under first year coach Beth Golitko. The team currently sits atop the Summit League standings with a 9-3 conference record and 17-27 record overall. The team had some great moments this season. The softball team defeated the University of Iowa on the road. We got to see ace Emily Ira surpass 500 career strikeouts as a junior, and see freshman Alyssa Ealy hit a walk-off double against Fort Wayne for her first career hit as a Leatherneck. The athletes in the Purple and Gold did extraordinary things this year. Even though the respective sports programs did not win any championships for the University, the student-athletes in each sport forever changed the culture within each locker room they were apart of.